November monthly data reported this past week was sparse, but included Case-Shiller home prices, which continued to rebound, and new home sales, which were flat. 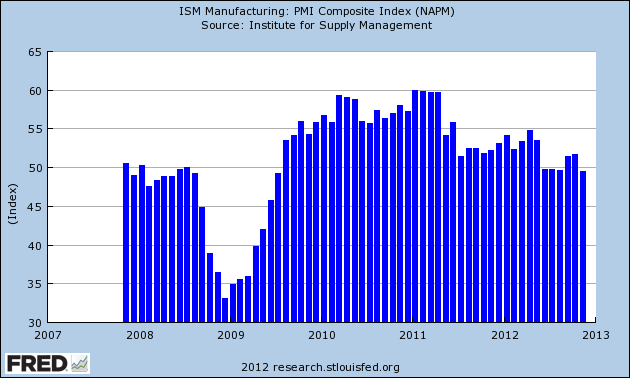 The Chicago PMI manufacturing index expanded slightly. Consumer confidence about the present increased sharply, but confidence about the future declined just as sharply, probably due to the "fiscal cliff" fiasco in Washington. This decline will be reflected as a component of the LEI. I watch the high frequency weekly indicators because even though they are more noisy, they will signal a turn or continuation in the direction of the economy well before monthly data is reported. Even now November monthly data is still affected by Hurricane Sandy, while the weekly data is already completely unaffected. The Department of Labor reported that Initial jobless claims fell from 361,000 to 350,000. The four week average fell by 11,000 to 356,750. As I suggested last week, this week saw a new post-recession low in the 4 week average. Since 2 and 3 weeks ago were still slightly affected by Sandy, we could set yet more new lows in the next week or two. The American Staffing Association Index again remained at 94. The general trend in this index is now declining slightly in comparison to last year. The Daily Treasury Statement showed that for the first 18 days of December, $156.5 B was collected vs. $139.0 B for the first 18 days of December last year. For the last 20 days ending on Thursday, $156.5 B was collected vs. $151.0 B for the comparable period in 2011, an increase of $14.5 B or +9.7%. Tax collections have continued to increase sharply for well over a month. The ICSC reported that same store sales for the week ending December 21 rose slightly, up +0.7% w/w and were up +3.2% YoY. Johnson Redbook showed a 2.9% YoY gain, which is a strong gain for them. The 14 day average of Gallup daily consumer spending as of December 27 was $85, compared with $77 for this week last year. Gallup's report has been running strongly positive this month. Weekly BAA commercial bond yields rose +.07% this week at 4.70%. Yields on 10 year treasury bonds also rose +.11% to 1.80%. The credit spread between the two likewise decreased by .04% to 2.90%. Spreads are well off their 52 week highs. The Mortgage Bankers' Association did not report during this holiday week. The Federal Reserve Bank's weekly H8 report of real estate loans this week rose 28 w/w to 3549. The YoY comparison, which is from the bottom, increased to +2.3%. YoY weekly median asking house prices from 54 metropolitan areas at Housing Tracker increased +2.6% from a year ago. YoY asking prices have been positive for over an entire year. M1 fell -1.9% for the week, but increased +2.5% month over month. Its YoY growth rate declined slightly to +13.2%, so Real M1 also fell to +11.4% YoY. M2 increased +0.3% for the week, and was up +1.1% month over month. Its YoY growth rate rose to 8.1%, so Real M2 rebounded to 6.3%. The growth rate for real money supply has started to increase again in the last month. The American Association of Railroads reported that total rail traffic increased for the second week in a row, up +24,900 carloads YoY, or +4.9%. Non-intermodal rail carloads also up for the first time in many months, +2200 or +0.9%. Coal hauling was off -14,500, so ex-coal carloads were up +17,100. Negative comparisons declined to a recent low of 5. Intermodal traffic, which had suffered due to Pacific port strikes, rebounded to +22,300 or +10.2% YoY. It is very unlikely that this rebound will be sustained at this level. Gasoline prices rose $.01 last week to $3.26. This is equal to last year's seasonal lows and probably marks the seasonal low this year as well. Oil prices per barrel increased from $88.38 to $90.70. Gasoline usage was down for one week at 8608 M gallons vs. 8923 M a year ago, or -3.5%. The 4 week average at 8517 M vs. 8761 M one year ago, was off -2.8% YoY. 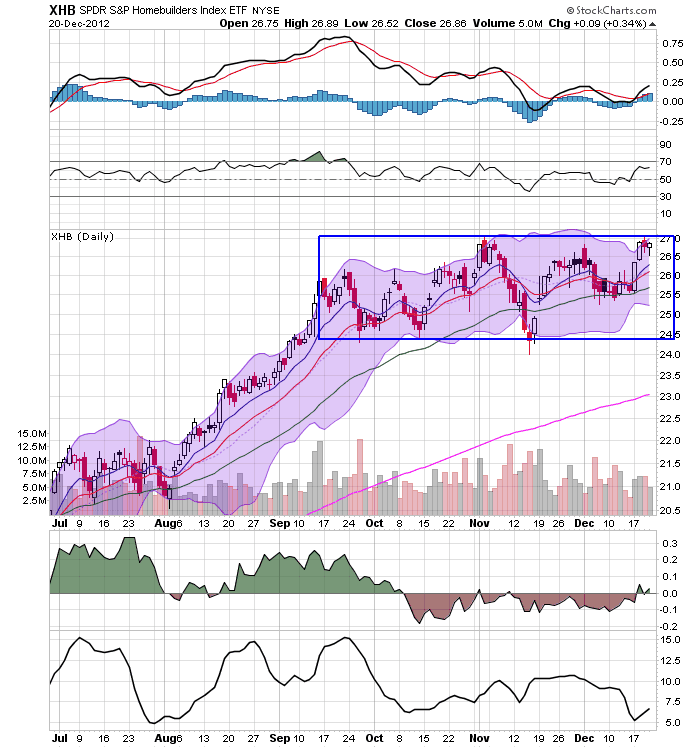 The TED spread rose sharply from 0.26 to 0.30, at the high end of its 3 month range. The one month LIBOR remained staady at 0.2097, near its 3 year low. The Baltic Dry Index was essentially flat, drifting down 1 from 700 to 699, a 3 month low, but still within the middle of its 1 year range. Harper Peterson took a holiday break and did not report its Harpex Shipping Index this week. The longer term declining trend in shipping rates for the last 3 years is intact. Finally, the JoC ECRI industrial commodities index rose from 124.57 to 125.64. It is now up 7.07 YoY. There was very little weakness in the high frequency data this past week. Shipping remains weak, as does gasoline usage. There were slight increases in bank lending rates and interest rates. But almost everything else was positive or strongly positive. Layoffs set a new nearly 5 year low. Tax withholding is soaring. Housing loans and prices are positive. Consumer spending continues to be very positive. Gas prices are seasonally accomodative. 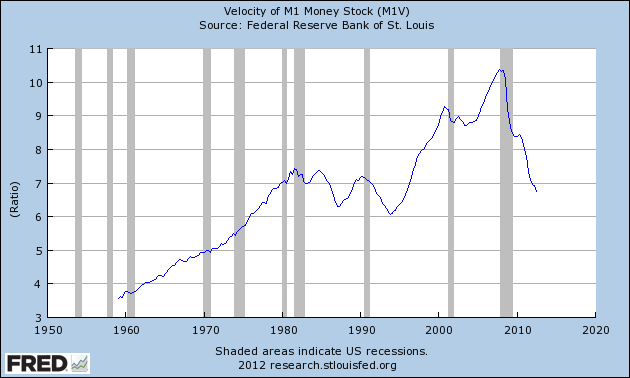 Money supply is very positive. Commodity prices signal strength. This week railroad data was again quite positive. Just as at the end of last year, the most up-to-date weekly data shows a solid positive bias, perhaps reflecting a new seasonality of autumn and winter growth, that has been balanced by spring and summer stalls. Meanwhile, the "fiscal cliff" remains a wild card. Have a nice weekend, and best wishes for a happy and safe New Year. The last two weeks have seen the highest amount of consumer spending since 4 years ago, and the spike last week is by far the highest since 4 years ago as well. So, how does this square with the MasterCard result? Two reasons are likely. First of all, the MasterCard result includes all shopping since October 28, i.e., just before Sandy. Spending was depressed from then until mid-November. Second, MasterCard is reporting credit card purchases only. Gallup, by contrast, is a relatively small sample - and so more volatile - and further is a self-report of all consumer spending. So while credit card transactions may only have increased slightly, cash buying by more frugal or budget-conscious consumers may have increased more substantially. So I'm certainly not saying that the MasterCard data is wrong. But the Gallup consumer data earned its bones during the debt ceiling debacle last year, when it accurately and in real time showed that consumers were not slowing their spending. Bottom line: the consumer may not have been as Scrooge-ish as reported yesterday. Initial jobless claims are generally acknowledged to be a short leading indicator for the economy. With this morning's report of 350,000 new claims being filed last week, the 4 week average fell to 356,750. This is the lowest 4 week average in nearly 5 years! In the nearly 50 year history of initial jobless claims data, there has never been a new low in initial claims set during a recession. Back in July I took a look at the historical record. In all cases but one since records started to be kept back in the 1960s, initial jobless claims rose 10% from their lows before a recession began. The lowest increase was 5%. Once recessions have begun, the number of claims rose inexorably. The shortest period of time between the low in claims and the onset of recession was 2 1/2 months. While we did have two weeks post-Sandy where initial claims were more than 10% above their previous post-recession low of 363,000, my calculations have shown that ex-Sandy, the four week average of new claims would only have risen into the low 370,000s range. While initial jobless claims are only one indicator, it is unheard of for claims to be falling to new lows unless the economy is expanding, and is strong evidence against any thesis that a recession began earlier this year. P.S. : The data for one week ago suggests that the effects of Sandy have almost completely dissipated. Combined NY and NJ claims one week ago were 9.4% of all claims filed, vs. 9.0% one year ago, and vs. 8.9% in October before Sandy struck. At worst, Sandy may have had about an impact of about 1000 claims. A recession is generally defined by the NBER as a substantial downturn in production, employment, sales, and income. Now that the November numbers are in, let's take a last look for where those numbers stand in 2012. As of now, 3 of the 4 metrics are still rising. Only industrial production has contracted since that time. So aggregate hours have also continued to increase. My conclusion is that, by most measures, the expansion has continued through November. Nevertheless it is clear that, no matter how you measure, the economy slowed markedly by March and has not picked up momentum since. Both debt service payments (blue line) and total household onligations (red line) are now less than at any time since 1984. While in recent quarters the rate of decrease has slowed, debt service payment are now only 0.1% above their all time low. U.S. home owners are refinancing their mortgages at the fastest clip since 2005, but the difference now is they are putting cash in, not taking it out. At the going rate, 25 percent of all first-lien U.S. mortgages will be refinanced this year, according to LPS Applied Analytics. That represents about $7.1 billion —just through June of this year — in savings on monthly payments, according to economists at Freddie Mac, who ran the numbers for this report. This equates to about 0.6% of all retail spending per month. I have long suspected that, before this cycle is over, households would set new all time lows for debt service. That looks very likely now. If anything, refinancing has increased in the last few months with new record lows in mortgage rates, and is probably keeping the economy from tipping back into recession. November monthly data reported this past week included the highest number of housing permits in 4 years, and a very good report on new home sales as well. Durble goods also showed a solid increase. 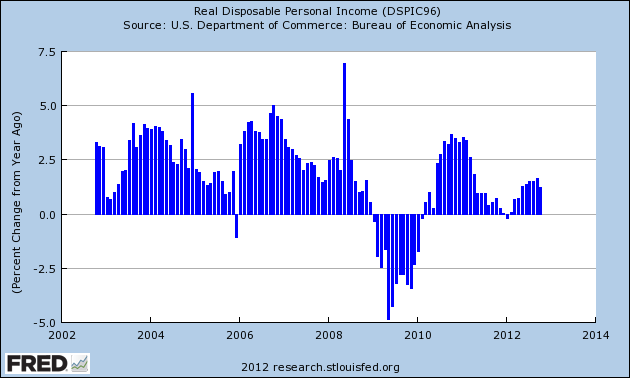 Personal income, spending, and savings also all rose. The Empire State manufacturing index contracted, while Philly's improved. On the other hand, consumer sentiment soured sharply, most likely in response to the "fiscal cliff" shenanigans in Washington. The Leading Indicators in November also declined -0.2, showing a complete stall over the last 6 month period. Had Sandy not impacted initial jobless claims, most likely the LEI would have risen +0.1 instead. Once again, let me make this reminder that I watch the high frequency weekly indicators because even though they are more noisy, they will signal a turn or continuation in the direction of the economy well before monthly data is reported. In particular, right now November monthly data is still affected by Hurricane Sandy, while its affect the weekly data has almost completely abated. The Department of Labor reported that Initial jobless claims rose from 343,000 to 361,000. The four week average fell by 13,750 to 367,750. As of one week ago, the effects of Hurricane Sandy were still slightly affecting the weekly number. As the elevated post-Sandy numbers wash out, the 4 week average should continue to decline slightly for at least one more week. It is quite possible that we will see a new post-recession low in the 4 week average next week. The American Staffing Association Index remained at 94. The general trend in this index is now declining slightly in comparison to last year. The Daily Treasury Statement showed that for the first 14 days of December, $115.6 B was collected vs. $103.1 B for the first 14 days of December last year. For the last 20 days ending on Thursday, $151.0 B was collected vs. $142.3 B for the comparable period in 2011, an increase of $8.7 B or +6.1%. Tax collections have continued to increase sharply for over a month. The ICSC reported that same store sales for the week ending December 14 declined -4.3% w/w but were up +3.5% YoY. Johnson Redbook showed a 2.4% YoY gain, which is a strong gain for them. The 14 day average of Gallup daily consumer spending as of December 20 was $83, compared with $78 for this week last year. Gallup's report has been running strongly positive this month. Weekly BAA commercial bond yields rose +.06% this week at 4.63%. 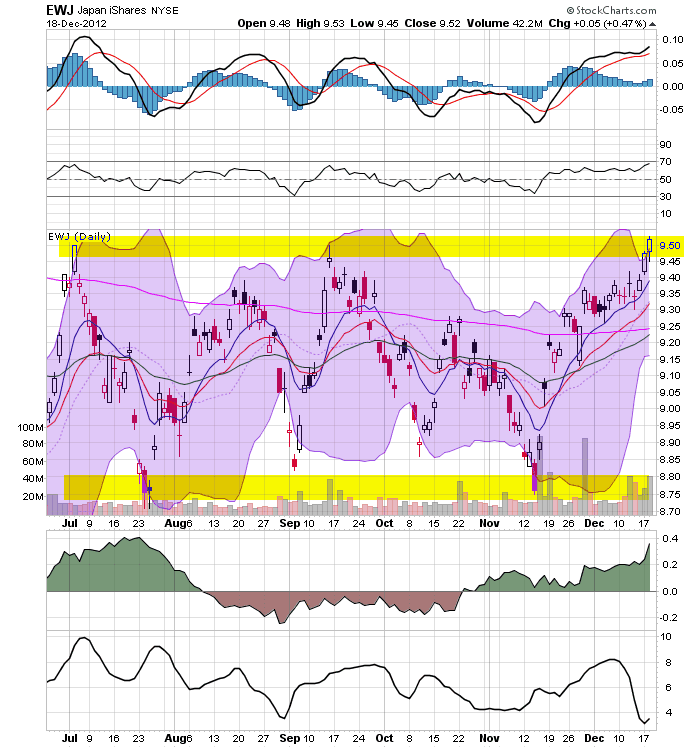 Yields on 10 year treasury bonds also rose +.07% to 1.69%. The credit spread between the two likewise decreased by .01% to 2.94%. Spreads have generally increased in the last month, but remain well off their 52 week highs. The Mortgage Bankers' Association reported that the seasonally adjusted Purchase Index fell -5% from the prior week, but increased 9% YoY, close to if not at a 2 year high. The Refinance Index declined 14% for the week, as mortgage rates rose. The Federal Reserve Bank's weekly H8 report of real estate loans this week declined -2 w/w to 3521. The YoY comparison, however, increased to +1.3% and is 1.4% above its bottom. YoY weekly median asking house prices from 54 metropolitan areas at Housing Tracker increased +2.3% from a year ago. YoY asking prices have been positive for over an entire year. M1 rose +0.3% for the week, and also increased +3.2% month over month. Its YoY growth rate declined slightly to +13.6%. Real M1 also fell to +11.8% YoY. M2 increased +0.5% for the week, and was up +0.4% month over month. Its YoY growth rate rose to 7.7%, so Real M2 rebounded to 5.9%. 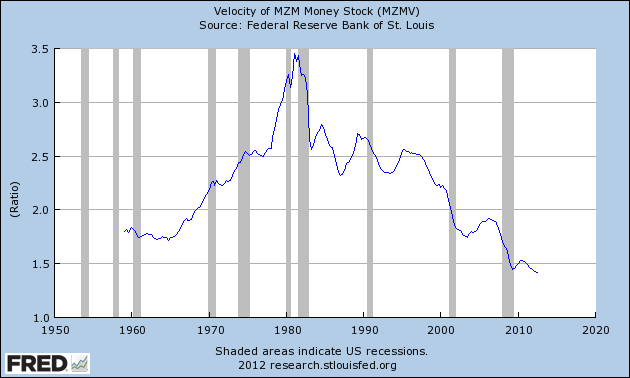 The growth rate for real money supply has started to increase again in the last few weeeks. The American Association of Railroads reported that total rail traffic increased for the first time in many weeks, up +6600 carloads YoY, or +2.2%. Non-intermodal rail carloads were again off significantly, -12,000 or -3.9%, and as usual entirely due to coal hauling, which was off -17,500. Ex-coal carloads were up +5500. Negative comparisons remained at 8. Intermodal traffic, which had suffered due to Pacific port strikes, rebounded to +18,600 or +8.0% YoY. 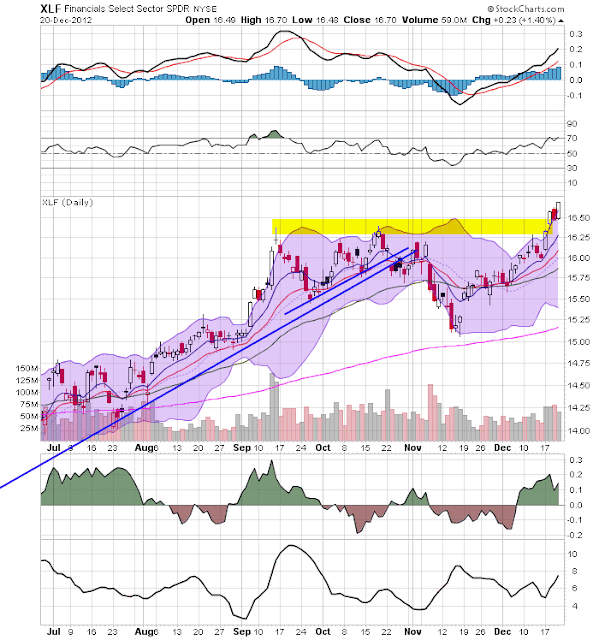 It is very unlikely that this rebound will be sustained at this level. Gasoline prices fell $.10 last week to $3.25. This is equal to last year's seasonal lows and probably marks the seasonal low this year as well. Oil prices per barrel increased from $86.73 to $88.38. Gasoline usage was down for one week at 8610 M gallons vs. 8879 M a year ago, or -3.0%. The 4 week average at 8472 M vs. 8722 M one year ago, was off -2.9% YoY. The TED spread fell from 0.29 to 0.26, in the middle of its 3 month range, and also in the middle of its 3 year range. The one month LIBOR rose from 0.2090 to 0.2097, near its 3 year low. The Baltic Dry Index fell sharply again from 784 to 700, a 3 month low, but still within the middle of its 1 year range. The Harpex Shipping Index also fell 1 more to yet another new 52 week low of 352. The longer term declining trend in shipping rates for the last 3 years is intact. Finally, the JoC ECRI industrial commodities index rose from 123.20 to 124.57. It continues to be positive YoY, up 5.76. Most of the recent themes in the weekly data remain intact. Manufacturing is weak, as are shipping and gasoline usage. Consumer sentiment is souring. On the other hand, domestic rail ex-coal is positive and improving. Housing continues its resurgeance from a very low level. Consumer spending remains strong. 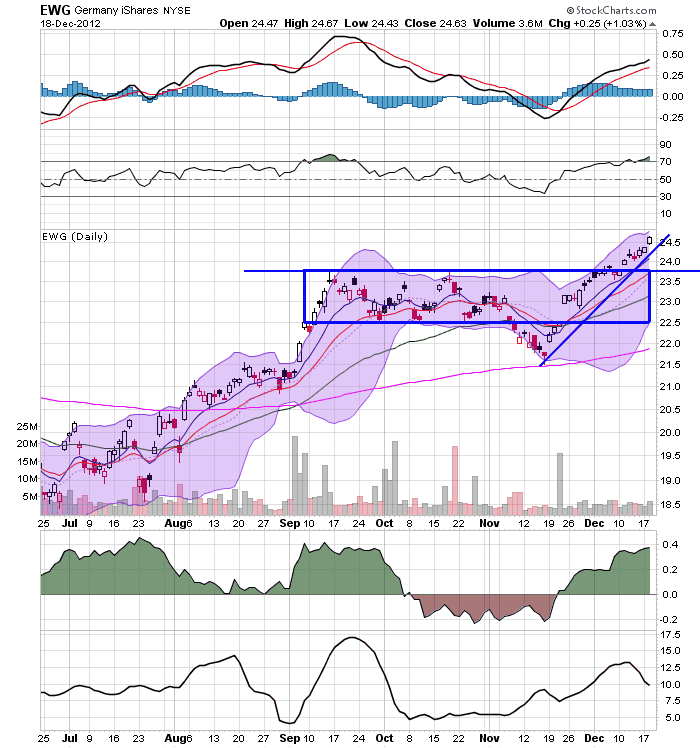 Money supply is strong. Weekly employment data is generally positive, although temporary help may be flagging. Gas prices are very accomodative at the moment. Commodity prices are positive. Bank lending rates, bond rates, and credit spreads have eased slightly. This week railroad data also turned quite positive. The "fiscal cliff" is a wild card, and the effects of Sandy remain in the monthly data. In general the most up-to-date weekly data shows a solid positive bias, perhaps reflecting the new seasonality of autumn and winter growth, balanced by spring and summer stalls. At the same time, the flat LEI should not be discounted, as it signifies a complete stall at some point next year, although a post-Sandy rebound in December data, especially jobless claims, may make for a short-lived signal. 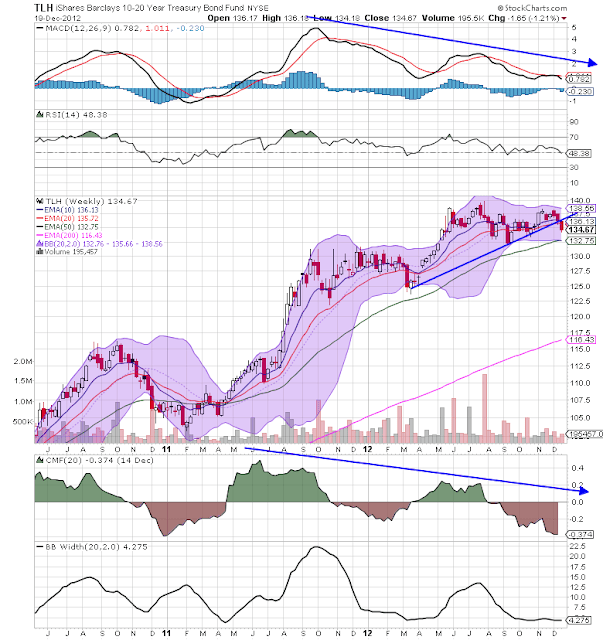 Weekly indicators will be posted, but probably not until tomorrow morning. The economic data is essentially finished for the year, but I do have a number of things I want to post about, including taking a look at at how well or poorly my 2012 forecast panned out. The problem is having the time to put the posts together. The bottom line is, I will have posts this coming week, but sporadically and probably not daily. As for my co-blogger Bonddad, my bet is he won't be able to keep himself away from the computer for a full week and a half! We'll see. Update From Bonddad: What do you mean I can't stay away from the keyboard for more than a week?!?!?!?!?!?! The last few weeks of the year are always slow. My guess is that at least half the staff at most financial firms are already taking Christmas vacations. Next week is an inherently slow week, and with New Years starting the following week, this seems to be a good place to say Merry Christmas. I won't by posting anything until the beginning of the year; NDD will probably put a few things up next week. 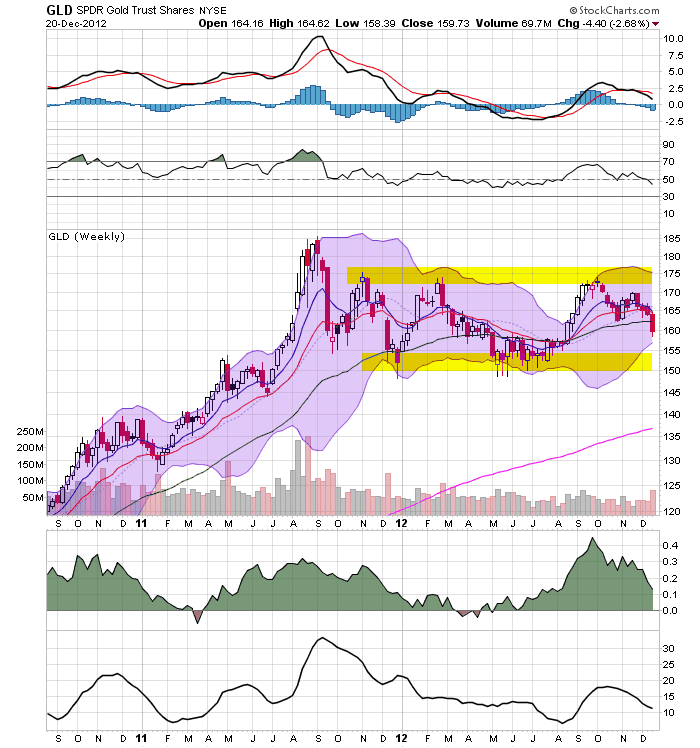 The daily gold chart (top chart) shows that prices have broken an uptrend started in late July. 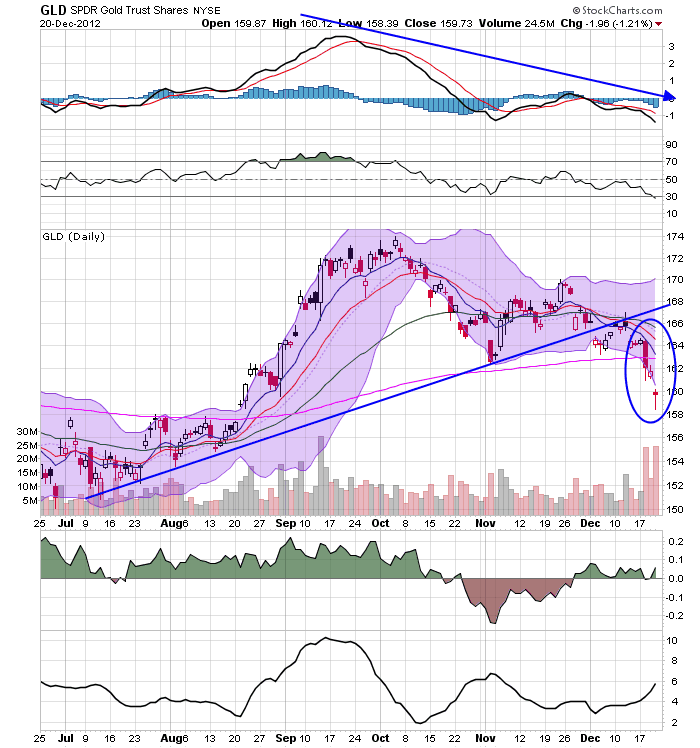 Prices have also moved through the 200 day EMA and are pulling the shorter EMAs lower. Momentum has dropped and the CMF is weak. Finally, the heavy volume indicates traders are looking to get out. 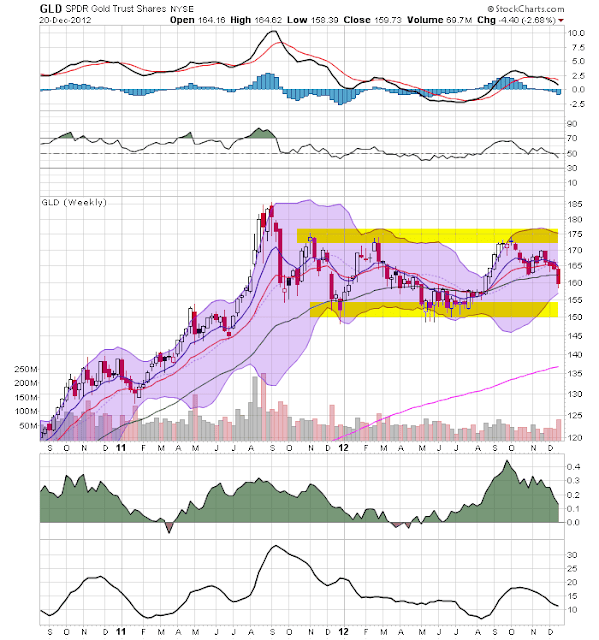 However, the weekly chart (bottom chart) shows that prices are still trading in a range between ~150 and ~175. 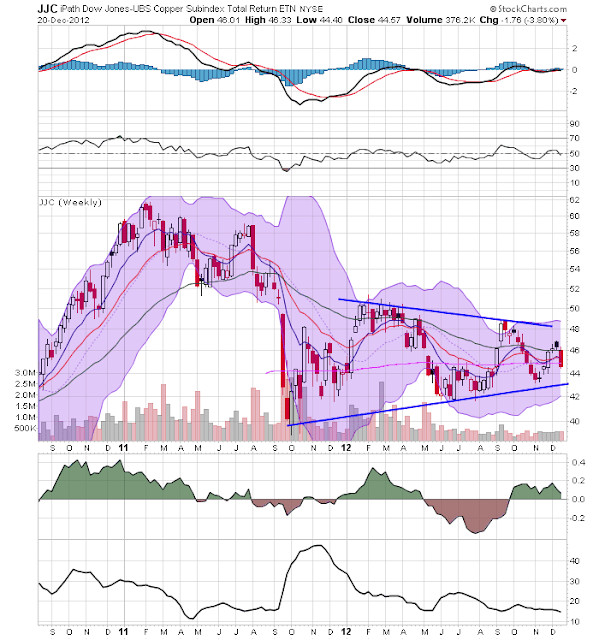 The weekly chart of copper shows that prices are still consolidating in a symmetrical triangle pattern, consolidating right around the 200 day EMA. After the weaker housing starts news earlier in the week, the homebuilders section has stalled at upside support. 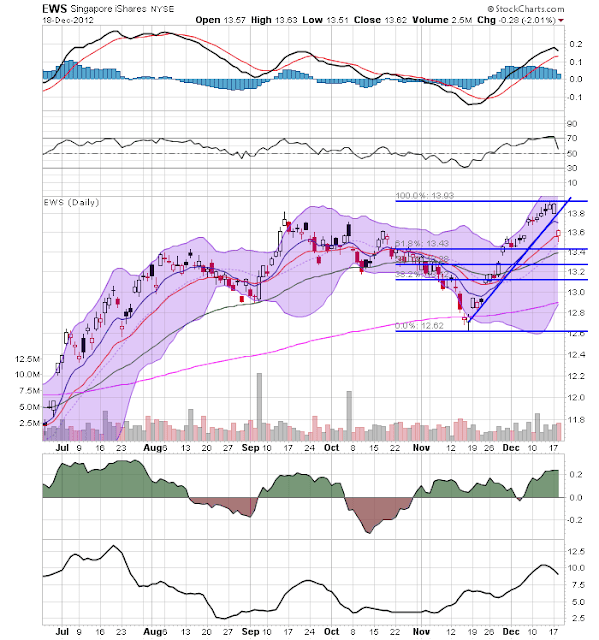 The financial sector has broken through resistance right around the 15.25 area. 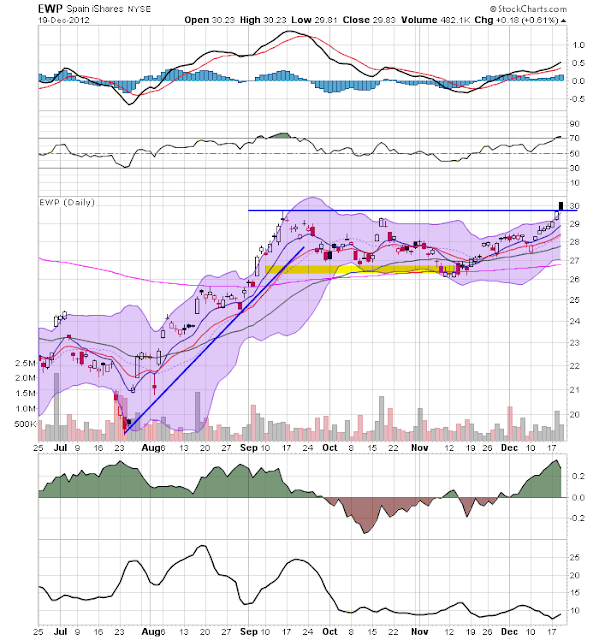 Prices are pulling the shorter EMAs higher on decent volume and rising momentum. 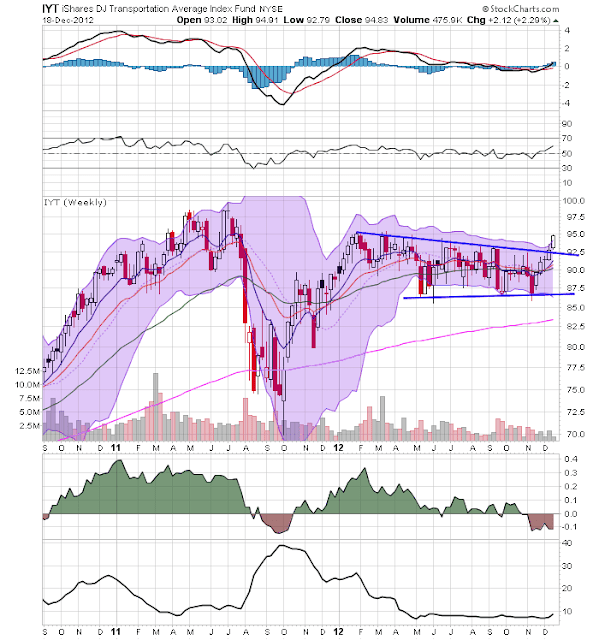 Considering that financials comprise one of the largest sectors of the SPYs, this is an important development. I've pointed out we can reasonably calculate Sandy's affect on initial jobless claims by backing out NY and NJ, comparing claims in those states to what they were a year ago as well as a month before Sandy, and using the unadjusted numbers from the remaining 48 states to calculate what the overall number would have been had Sandy not occurred. I updated that last week as to the claims from the week ending December 1. While I can't make any statements about today's initial jobless claims number, we now have the state by state data for last week's number, and that shows that NY and NJ still had significantly elevated claims compared with the same week one year ago. Specifically, for the week ending December 8, NY and NJ claims made up 10.6% of all claims, compared with 8.9% in the month before Sandy, and 9.3% in the same week one year ago. Calculating the effect ex-Sandy from the other 48 states, it appears that last week initial claims would have initially been reported at 337,000 rather than 343,000. The 4 week moving average would have been 361,000, the lowest since the onset of the last recession at the end of 2007. I'll continue to report on this until NY and NJ claims return to their normal range. Because initial claims are a component of LEI, the dramatic increase in claims after Sandy severely impacted that index, contributing -0.35 to their ultimate -0.2 result. Had Sandy not impacted those claims, the LEI probably would have come in at +0.1. 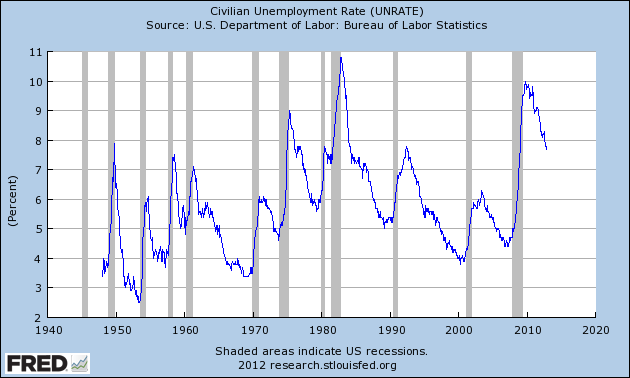 Of course, the steep decline in initial claims will presumably contribute just as positively to the LEI next month. Spoiler alert: We could already be in a recession. This is not the conventional wisdom. The common narrative goes some like talks look ugly, but in the end things will get resolved either before Jan. 1 or later in the month and the economy gets a new lease on life. See MarketWatch’s fiscal-cliff page. 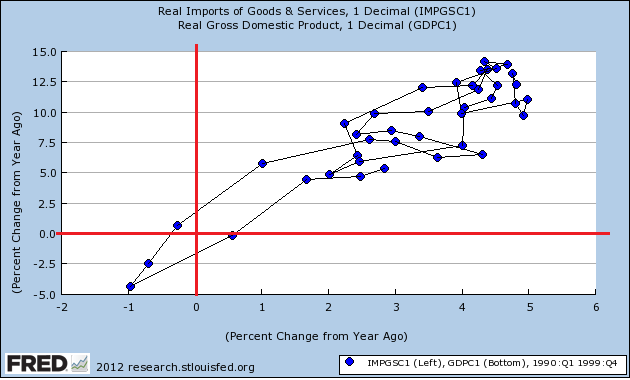 The recession signal is being sent from the latest U.S. current account deficit report released earlier Tuesday. I don't think we're currently in a recession, so I wanted to run the numbers on this statement. What I found was really interesting. Consider the following scatter plots. Above are four decades comparing the year over per percentage change in real imports on a quarterly basis, with the year over year percentage change in real GDP on a quarterly basis. The top chart is for the 1970s, the second from the top is for the 1980s, the third from the top is for the 1990s and the fourth from the top is for January 2000 to July 2012. 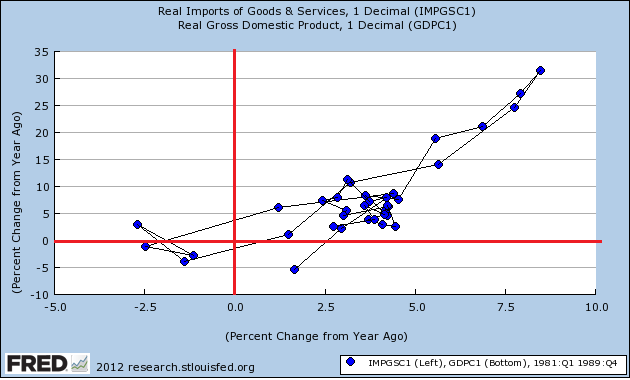 Note there is a pretty strong correlation between net negative YOY change in imports and net negative year over year GDP and positive YOY imports with net positive YOY GDP. The primary difference between the story's measurement and the above is the story is using month to month percentage change and the above is using a quarter measurement. 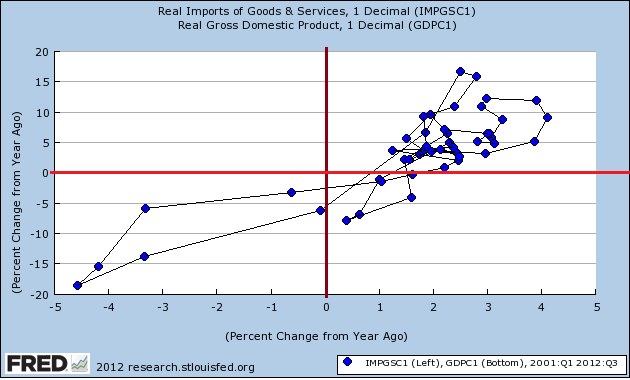 Put another way, imports are a pretty good coincident indicator. The UK government debt has low interest rates now because growth is low and demand for safe assets is high. British interest rates decline in response to bad news on growth, and market measures of the riskiness of gilts increase when interest rates and growth drop. The opposite should hold – rates and market risk should rise together – if indebtedness were markets’ concern. They don’t and it isn’t. Private UK businesses have kept adding workers in recent years (albeit some part-time or temporary) because they view future prospects as unchanged or better. Employers only increase staff in a flexible decentralized labour market like Britain’s when they think wage costs are competitive. The opposite should hold – declining growth and wages should lead to permanent cuts in employment – if UK potential growth was down for most businesses. They didn’t and it isn’t. The spreads between the interest rates that small businesses and first time mortgage borrowers must pay for loans versus established large borrowers, and the fees that those new borrowers are charged have gone up and stayed up. If there were lack of demand for investment, the interest rates and fees that banks could charge for loans would be declining – they are rising instead. Sterling has been stable in value since its 2008 depreciation, and foreign direct investment continues to pile in to such industries as auto manufacturing and fancy foods as well as business services. If the lack of investment were due to doubts about government solvency or business competitiveness, capital would be flowing out of the UK and the pound would be declining. The opposite is the case. Cuts in government spending and increases in taxation have had large effects per pound on consumption and growth overall (far larger than the Government, the MPC, and the OBR projected). That occurs when confidence is being beaten down rather than raised up by fiscal consolidation. If lack of confidence in government finances were a major weight on British households and businesses, the direct drag from fiscal contraction would be offset (if not reversed) by a rise in investment. Again, the opposite is the case, and no such confidence effects have been seen. 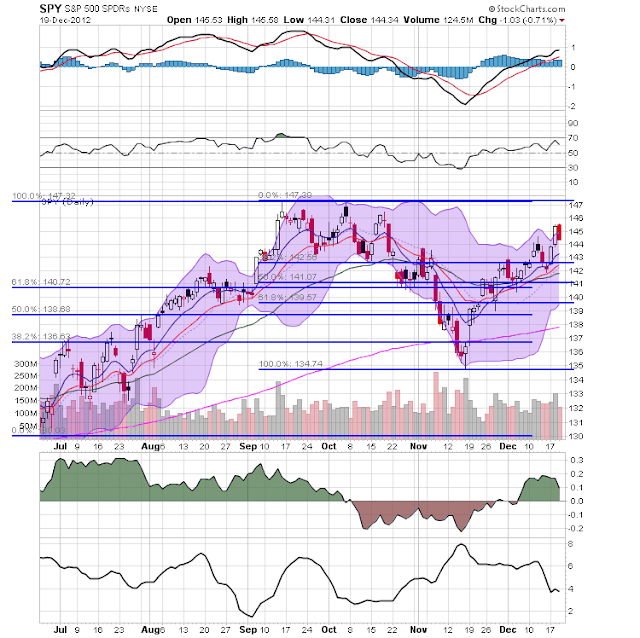 The top chart shows that the SPYs have broken through most upside resistance and are now in the middle of a simple sell-off during the rally as traders take profits. 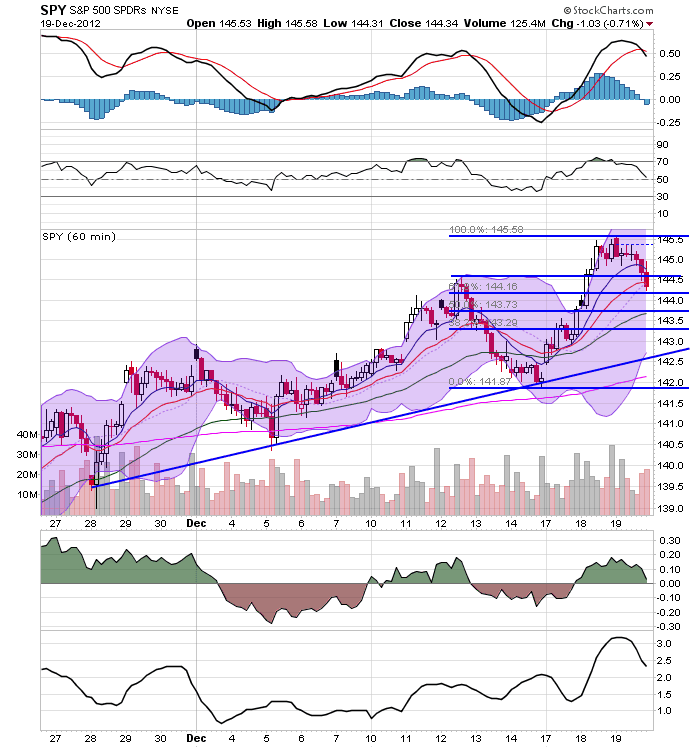 The 60 minute chart (lower chart) shows that prices are currently in the middle of standard Fibonacci support. The real issue for the market right now is the fiscal cliff. Assuming a deal emerges that the markets like, expect the 147 handle on the SPYs to be vulnerable to a strong breech. The weekly charts of the long-end of the yield curve are showing increasing technical weakness. 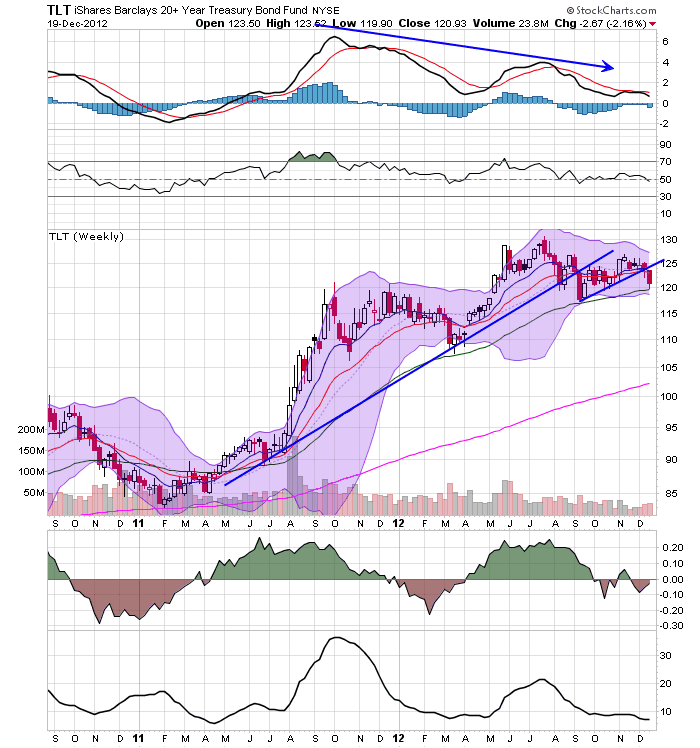 The TLHs (10-10 years, top chart) have decreasing momentum and volume flow. 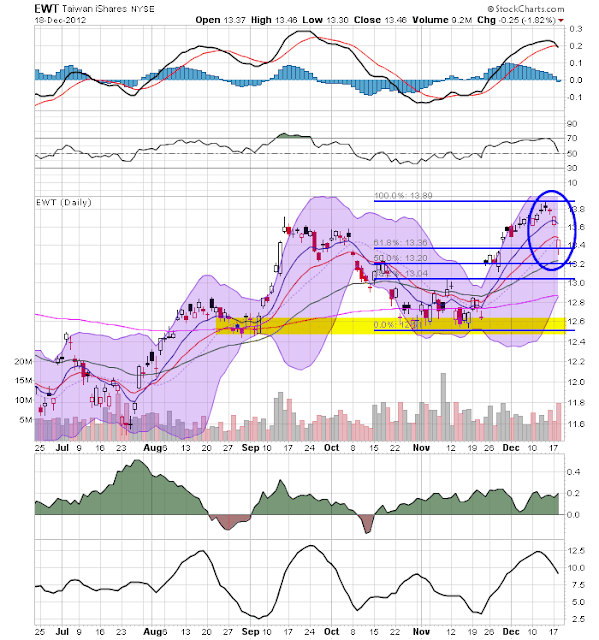 In addition, prices have broken support established during a rally earlier this year. 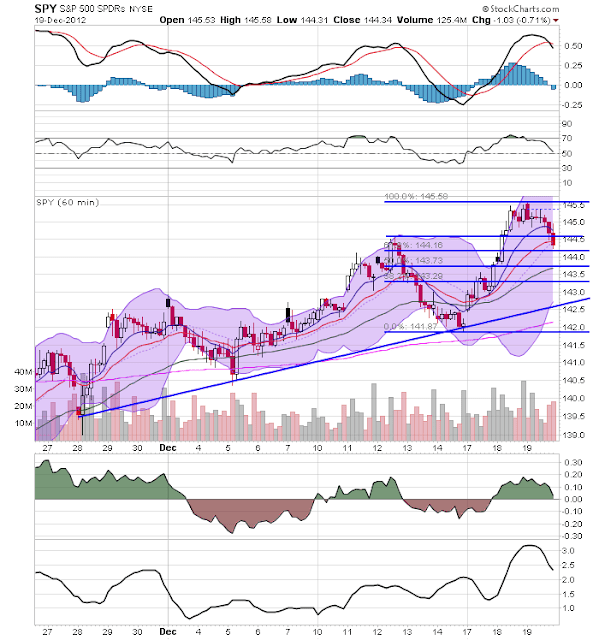 The TLTs have broken shorter them support, have decreasing momentum and a weakening CMF picture. 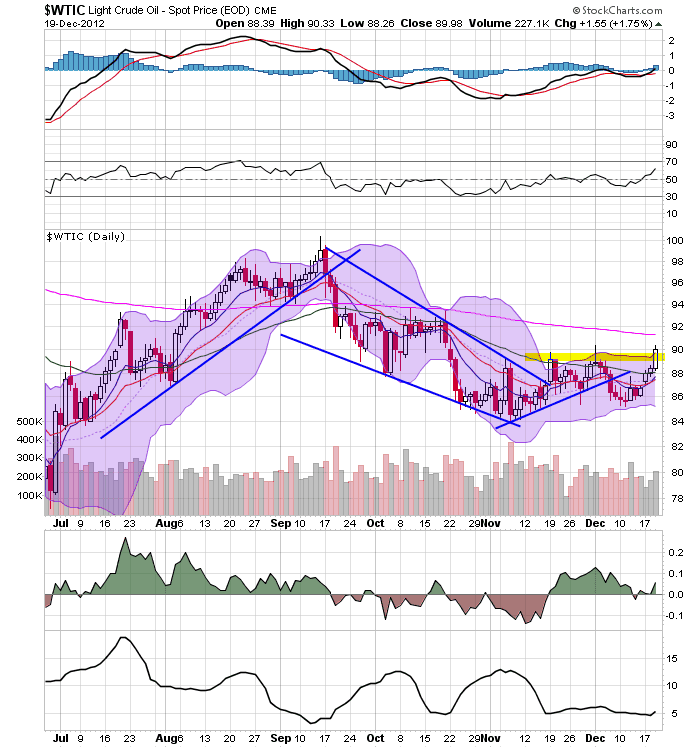 Yesterday, oil made a strong move higher on decent volume. The next logical area of resistance is the 200 day EMA. The U.S. Bureau of Labor Statistics measures two kinds of CPI statistics: CPI for urban wage earners and clerical workers (CPI-W), and the chained CPI for all urban consumers (C-CPI-U). Of the two types of CPI, the C-CPI-U is a better representation of the general public, because it accounts for about 87% of the population. CPI is one of the most frequently used statistics for identifying periods of inflation or deflation. This is because large rises in CPI during a short period of time typically denote periods of inflation and large drops in CPI during a short period of time usually mark periods of deflation. An alternative measurement for the Consumer Price Index (CPI), removing the biases associated with new products, changes in quality and discounted prices. The chain weighted CPI incorporates the average changes in the quantity of goods purchased, along with standard pricing effects. This allows the chain weighted CPI to reflect situations where customers shift the weight of their purchases from one area of spending to another. The chain weighted CPI incorporates changes in both the quantities and prices of products. For example, let's examine clothing purchases between two years. Last year you bought a sweater for $40 and two t-shirts at $35 each. This year, two sweaters were purchased at $35 each and one t-shirt for $45. ((2 x 35 + 1 x 45)/ (1 x 40 + 2 x 35)) =1.0455. Using the chain weighted approach reveals the impact of a customer purchasing more sweaters than t-shirts. Overall GDP has grown strongly. 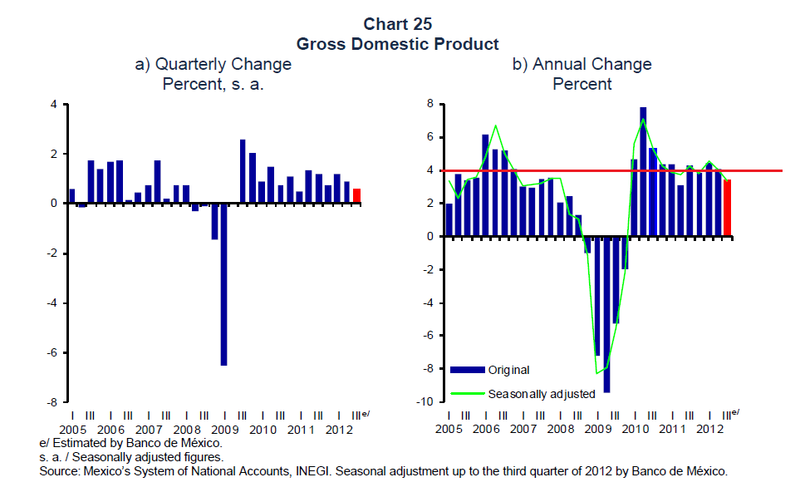 The chart on the right indicates that the quarterly percent change has been positive since 2009 and has been in the .75-1.5% range. The chart on the right shows that the annual rate of change has been positive as well -- 4% appears to be a good average to use for the last few years. 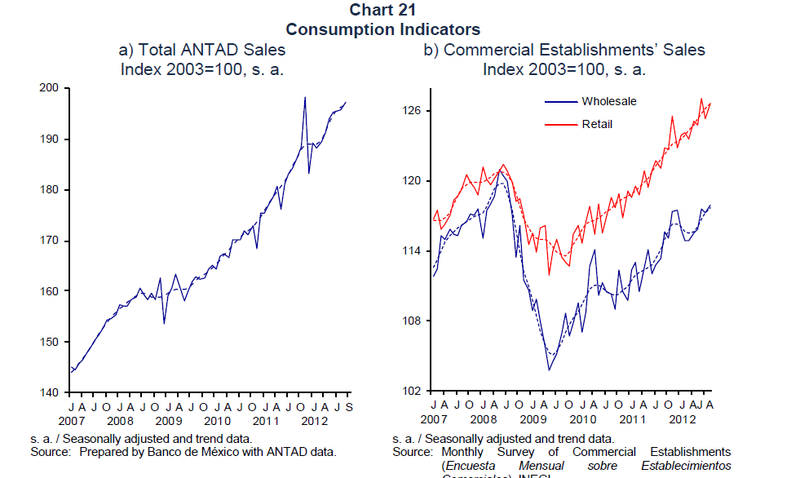 The left chart shows ANTAD sales (retailer's association) have been rising strongly over the last five years. 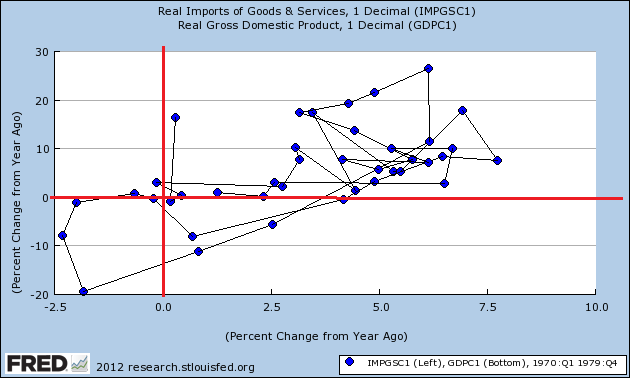 Also note these moved sideways during the recession. The right side also shows retail and wholesale sales, both of which have risen since their recession lows and both of which are now above their pre-recession peaks. A reason for the increase in consumption is the strong growth of wages. The left charts shows that wages have been growing in the 4% range for the last few years. The right chart shows that consumer confidence -- which although below pre-recession levels has been rising for the last few years. Finally, we see that remittances from the US are actually down. Investment has also been very strong. The left chart shows that overall investment (black line) has been rising consistently since the recession and is now above pre-recession levels. It has risen because of incredibly strong machinery and equipment investment (red line) and overall construction. Machinery investment has increased as a result of both domestic and imported machinery (middle chart). Finally, overall confidence for producers is strong. The left chart shows that total activity has been strong for the industrial and service sectors, while the middle chart shows that manufacturing has been strong -- even without a bump from auto production (the red line). Finally, total vehicle production (left char) is still very strong. 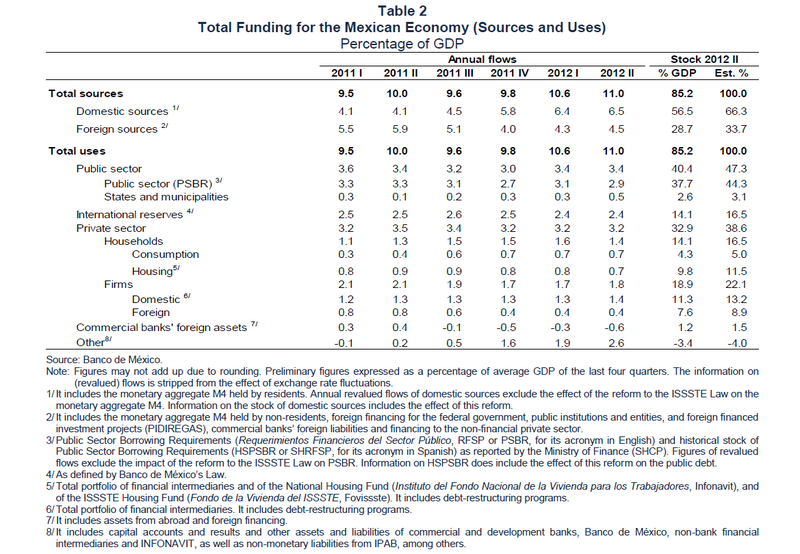 Finally, notice that the economy has adequate funding from both foreign and domestic sources. The bottom line is that -- despite the above mentioned problems -- the overall Mexican economy is doing very well, especially compared with the rest of the world. 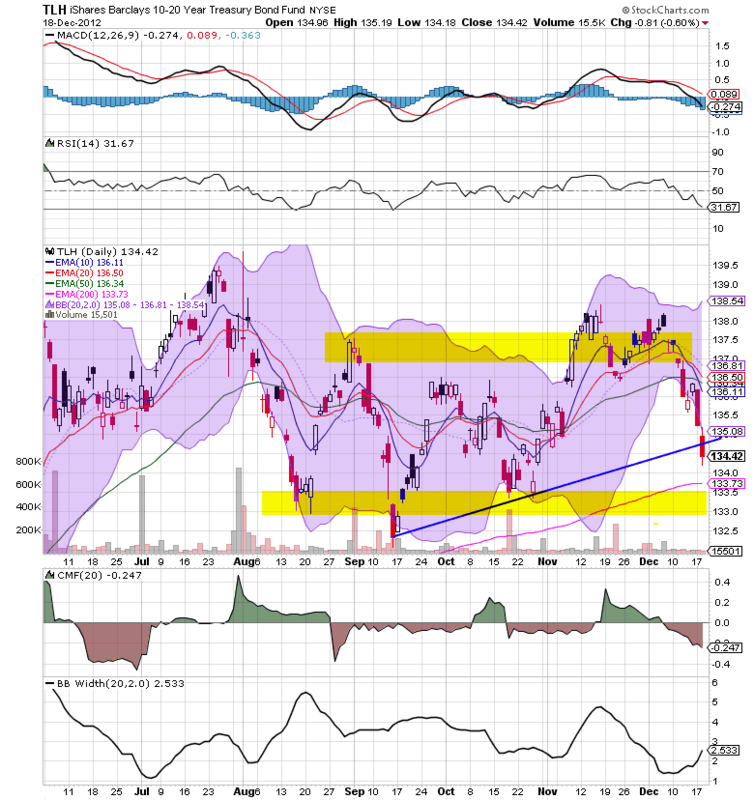 Both the Singapore market (top chart) and Taiwan market (bottom chart) have dropped sharply. The Singapore market did so yesterday -- dropping to the 10 day EMA -- while the Taiwan market started to do so a few days ago and is now through the 20 day EMA. The Singapore sell-off occurred on weaker volume, but the Taiwan sell-off is on high volume. For the last six months, the Japanese market has been one long consolidation pattern between 8.75 and 9.50. However, with the new government taking over, prices are right at upside resistance and may be ready for a break out. Over the last few days, I noted that the TLT's had broken support. Now the TLH's have followed suit, making their 200 day EMA the next logical target. The IYTs (transports) have broken through upside resistance. This could have significant bullish potential for the markets as a whole (Thanks to a specific reader for pointing this out). Yesterday I outlined my basic theory on the US economy since the end of the great recession and also talked about the good economic elements going forward. Now, let's look at the bad and ugly. Unemployment is still far too high (top chart) which is leading to very slow growth in real disposable personal income (lower chart). I believe these two charts throw cold water on the idea that the US economy -- whose growth is comprised mostly of consumer spending -- will grow at a stronger pace than right around 2% (give or take) for the first half of next year. There is simply too much slack in the economy to allow for upward wage pressures, leading to increased wages and stronger, sustainable consumer spending until at least August 2013 (3Q13). Also adding to the negative sentiment going forward is the fiscal cliff. Should no deal be worked out, we'll see spending cuts and a tax increase that will hurt growth, and probably lead to a shallow recession in the first half of 2013. 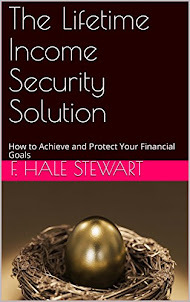 Substantial changes to tax and spending policies are scheduled to take effect in January 2013, significantly reducing the federal budget deficit. According to CBO’s projections, if all of that fiscal tightening occurs, real (inflation-adjusted) gross domestic product (GDP) will drop by 0.5 percent in 2013 (as measured by the change from the fourth quarter of 2012 to the fourth quarter of 2013)—reflecting a decline in the first half of the year and renewed growth at a modest pace later in the year. That contraction of the economy will cause employment to decline and the unemployment rate to rise to 9.1 percent in the fourth quarter of 2013. After next year, by the agency’s estimates, economic growth will pick up, and the labor market will strengthen, returning output to its potential level (reflecting a high rate of use of labor and capital) and shrinking the unemployment rate to 5.5 percent by 2018. 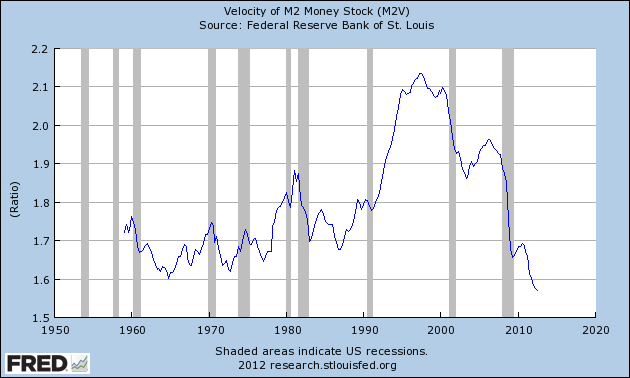 All three monetary aggregates -- MZM, M1 and M2 -- have a decreasing velocity. This tells us that the pace of transactions is slowing, leading to the conclusion that consumers are hoarding cash. Notice that the primary responses indicates either slowing activity or uncertainly caused by the situation in Washington. There is also concern regarding the international situation (see below). None of these statements bodes well for the future. The ugly is all international. As I noted last week, three big international economies -- Japan, the UK and the EU -- are all in terrible shape. Japan and the EU are in a technical recession, and the UK has seen little meaningful growth since 2008. It's difficult seeing the US grow at strong rates in any way with these three economic trading partners in such bad shape. These three economies greatly cloud the overall horizon and add nothing but potential downward pressure on US growth. While there are bright spots for the US economy, there are simply too many dark clouds to hope for anything other than sub-par growth for the next 6-12 months. Although consumers are confident enough to make durable goods purchases, the fiscal cliff, high unemployment, slow wage growth, slowing monetary velocity and a terrible international situation lead to the conclusion there is far more downside than upside to 2013.